When it comes to transporting your child or children around town in a stroller, taking public transit can be challenging at times. Crowded buses, insensitive fellow passengers, and inclement weather are just a few of the challenges that a parent or caregiver face. It can also be hard to know if double strollers are allowed on buses or if you will sometimes be asked to collapse your stroller en route. Knowing your rights as a transit user and having a plan for your trip can help to make your trip run smoothly. Here is information that is provided by Translink regarding the use of strollers on public transit in the Lower Mainland. As you read the latest regulations, consider this bus notification from 1977 describing the “look of anguish” that your mothers might have encountered on a bus driver’s face in the event that she tried to bring a stroller on the bus! Seating areas nearest the doors on SkyTrain, SeaBus and buses are designed for people with disabilities and for seniors. Seats at the front of buses – trolleys, 40’ conventional and 60’ articulated coaches – can flip up to accommodate people with mobility devices. Please vacate these seats immediately and help make room for them. Strollers may use this area; however, when demand dictates, the stroller must give way to people with mobility devices, including walkers. Children in strollers should be removed and the strollers collapsed. “First, really large strollers can’t be taken on the bus. The maximum stroller size we allow is 122 centimetres (48 inches) long by 60 centimetres (24 inches) wide. Here are some other considerations that will affect your journey. Which mode should you take – bus, SeaBus or Skytrain? The main consideration affecting whether you get on the Skytrain or SeaBus is available space. During rush hour it can be difficult to get your stroller onto the Skytrain, for example, as there is little room for movement inside the car. This is always a concern for parents who are taking their children to and from daycare. Additionally you might enter on one side, but need to disembark on the other side. For this reason, the more compact your stroller is the better. You can also expect to encounter different types of Skytrain cars. On the Mark 1 cars the seats by the door flip up creating an area for strollers. On the Mark 2 cars there is a barrier that makes it necessary to place a stroller in front of the doorway. Some buses are easier to enter with a stroller than others . The small commuter buses in Yaletown can only take an uncollapsed stroller if the driver drops the ramp at the back of the bus. This can be a slow and cumbersome option. The most spacious buses for strollers are the B-line buses. However B-line buses are popular with students and people going to work. Parents taking their children to and from daycare will need to be patient when taking these routes during rush hour. So far the Skytrain also seems to be more reliable in terms of strikes. It was the buses that were unavailable for four months nine years ago. Do you have to collapse your stroller before entering the bus? Passengers are not required to collapse their stroller if it is 60 centimetres/24 inches in width or narrower. Once the stroller is on on the bus, if the bus driver determines that it is required he or she could ask the passenger to collapse the stroller. Bus drivers seem to have a method to avoid this option. They have been known, for example, to ask a passenger to collapse a stroller before getting on the bus if the bus is crowded. Bus drivers have also asked passengers to wait for the next bus as there is already a stroller or wheel chair on the bus, or the bus is too crowded. The word on the street is that some bus drivers are reluctant to allow double strollers on buses and have either refused to let the stroller on board or have asked the parent or care giver to collapse the stroller. As you can imagine, this is not a viable option if you have small twin babies, for example. Keep in mind that technically a double stroller is a good deal wider than the maximum size allowed. Who has priority to use the front area of the bus? What is the best type of stroller to take on public transit? There are more options available if you are using a single stroller. You could choose anything an umbrella stroller, a lightweight option or a full feature, full size single stroller. Keep in mind that umbrella strollers are not appropriate for younger babies and leave a child less protected to the elements and the surrounding crowds. On the plus side, they are easier to collapse. 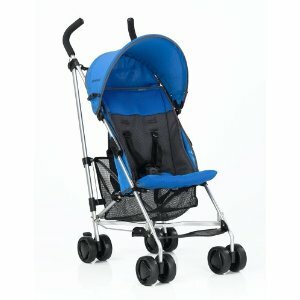 Full size strollers come in a variety of sizes and styles. Lightweight strollers have some of the features of a full size stroller but are lighter and more compact in style. The UPPABaby G-lite stroller (shown above), with five point harness, light frame and additional rain cover, looks promising. Keep in mind that three point harnesses should not be used with children younger than six months. Smaller children or children with weaker upper body control might need to be older than six months before they can use a three point harness. 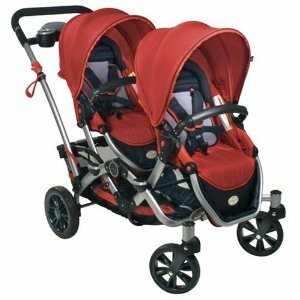 If you need to use a double stroller for twins or two young children who are close in age, the choices are more limited. Most full size, side-by-side double strollers hover at the 30 inch width mark or wider. Even the lightweight side by side strollers are, inevitably, wider than the 60 centimetres/24 inches allowed. Tandem strollers such as the Kolcraft Contours Options Tandem Plus look promising as they fit – give or take an inch – within the allowed dimensions. Although tandem strollers are less desired by some parents and care givers because it can be more difficult to maneuver a longer stroller rather than a side-by-side that is wider and shallower. How can I make the long ride on transit easier? – It is always a good idea to keep your bus pass in a larger pass holder and in the same, easily accessed location in your bag. If you are using change, collect the exact fare before the bus arrives. – Bus rides can be noisy and slow. Do you have quiet, special toys that your child loves to use? Why not save them for use when you are using public transit? Some children respond well to looking at books with a parent on a bus ride.These items can be a welcome distraction. – Simple snacks in easily carried containers are also a good idea. Snacks that spill or leave a trail of crumbs are less ideal. Drinks – even sippy cups – should be stored in plastic zip lock bags in case they spill. – Carry a minimum of supplies in a well designed bag that fits across the back (in a back pack) or in a bag in the basket below the stroller. In the event that you have to collapse the stroller, you do not want to be trying to cope with too many pieces of articles. – Keep your cell phone charged and call the phone number on the bus sign for information about bus times. – Arrive five minutes before the bus is scheduled to arrive. – Fashionable diaper bags look good draped over stroller handles, but are less efficient for public transit as it is important to keep your load as light as possible. – If you are using a lightweight stroller, the canopy provided will not be sufficient to shield your child completely from the sun. You will want a good hat and sunscreen on hand. Rain covers are available for the lightest strollers and are a good idea. – Wear a well designed rain slicker and lined rain boots on rainy days. Umbrellas are hard to handle when pushing a stroller and there is nothing worse than traveling long distances on public transit when your feet are cold and wet. It is also advisable to dress your child in zip up layers so that you can easily cool them off on crowded, hot buses during the rainy season. – A full size or lightweight stroller that reclines is ideal so that your child can sleep easier. – Greet the bus driver with a friendly smile and “hello” even if your trip is not progressing very well. What should you do if you have a concern about how your trip progressed on public transit. 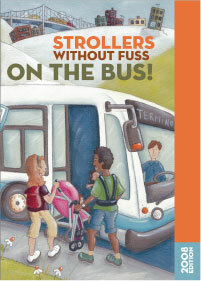 The Strollers Without Fuss on the Bus brochure was created by parents for use on the Montreal public transit system. Some of the information is different from what you will encounter in the Lower Mainland. For example Lower Mainland buses do not have picto-grams indicating that strollers have priority on the buses. The brochure is, however, an interesting overview for parents and care givers who are using public transit. The Green City Action Plan outlines the City of Vancouver’s plans to be the greenest city by 2020. Greater use of public transit is a core feature of this plan. Your use of public transit supports these initiatives in a significant way and helps to create a healthier world for you child’s current life and future years. Are Strollers on Public Transit a Nuisance? What do you think of this topic? We’d love to hear from you and invite you to use the comment function available below. I do find this helpful on information about transit system on the lower mainland; however, I find that it belittles me as a mom on transit, and that I am like the same as everyone else. I agree that wheelchairs have priority, but I feel the next generation is put last when the article talks about making a greener future. I find that this is forgeting that the next generation is ignored on transit, and everyone is above the next generation. This article is upsetting to read as a mom on how it’s hard to be a mom, but 1000% harder being on transit as it stands now as the city grows. I find that there could be more done to not only cater to the elderly and the disabled, but to cater a mom or caregiver that doesn’t have the opportunity to dismantle a stroller. Also, if the child is still small, it would be unwise to hold the small child on transit as stops can happen very suddenly and it may cause more harm outside of the stroller than inside. From a mom that is starting to hate using transit. Hi, Chelsea, I agree that keeping a child in a stroller is definitely a better option. Taking transit with a stroller is a challenge. In my case, I had twins in a side by side double stroller. I was fortunate because I lived near a Skytrain and lived in an area that had a 97% walk score. If I went on a bus, I preferred to have a single stroller. The worst time is during rush hour or when the bus is full of people and it’s raining outside. Most of the information in this post about what needs to be done on transit is shared content from BC Transit. As a mum, I wanted to know what my rights were so that I wouldn’t be caught by surprise. Their information states that you are no longer required to collapse a stroller. “This is a reminder that Coast Mountain Bus Company no longer requires that children be removed from strollers while traveling on buses. Transit Operators do expect, however, that the stroller will be kept under control at all times during the trip. The Motor Vehicles Act of B.C.” If that’s the case, then they have no grounds to ask for a stroller to be collapsed. Have you ever been asked to collapse yours? If you are, you could quote The Motor Vehicles Act.